After NaNoWriMo wraps up, we’ll all be proud of ourselves for our hard work, but also ready for a break. So, I would like to give away two books to one lucky winner as an end of November treat! 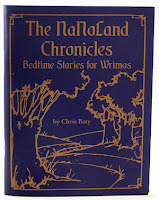 The first book you can win is The NaNoLand Chronicles By: Chris Baty. The second is a surprise that you will have to uncover. Each week in November I will post clues so that you can hunt down one of the words in the title of the mystery book. 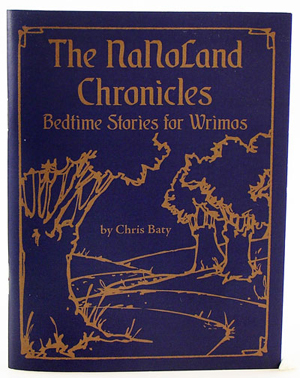 After all clues are posted, the first ten people to unscramble the words, and comment with the correct book title, will go into a drawing to win both books! The winner will be announced on December 1, 2011. Clues for Week One: The word you are looking for this week is three letters long. 1) Head over to Lora Rivera’s awesome blog. 2) The first letter can be found in Lora’s March 2011 post "Turns out the Chicken was Bad." It is the first letter of the fifth word in the last sentence of the post. 3) Find Lora’s post from Friday, January 21, 2011. The letter you want is the first letter in this post’s title. 4) The second letter can be found in Lora’s August 2011 post "A Little Calendar Fun." Find ‘How am I involved?’ The letter you’re looking for is the last letter in the word describing a four legged furry creature. Once you’ve hunted down this week’s word hold on to it and link up below so other treasure hunters can check out your blog! Lillie, how many letters? The directions point to three letters, but say there are only two? Sif, there are three letters in this week's word. It's two books I'm giving away. How's NaNoWriMo treating you so far? This is so much fun Lillie! I will mention it on my blog! So creative! Oooh fun! Ok, I think I've got it!